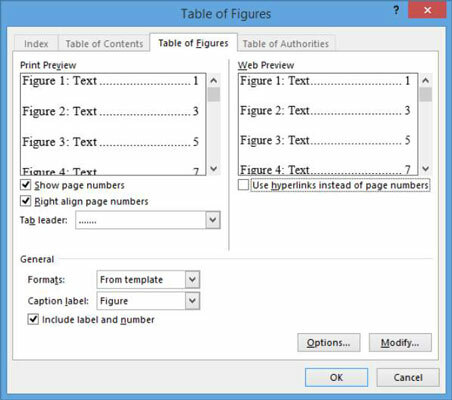 To accommodate a reference world which sometimes needs a Table of Figures, Word 2013 has a feature which helps you create your very own Table of Figures in just five easy steps! Remember, a Table of Figures is not necessary in a short document, but in very long reports with dozens or hundreds of figures, it can help readers greatly by providing quick access to the numbered figures. A Table of Figures is like a Table of Contents except instead of listing the categories and contents of the document, it lists the document’s figures and their captions. Open a Word 2013 document with several figures included in the document. Click at the bottom of the document to move the insertion point below the caption of the final figure and then press Ctrl+Enter to create a page break. Type Table of Figures, and apply the Heading 1 style to the paragraph (from the Home tab, in the Styles group). Press Enter to start a new paragraph below the text you just typed and then choose References→Insert Table of Figures. The Table of Figures dialog box opens. Deselect the Use Hyperlinks Instead of Page Numbers check box and then click OK to insert the Table of Figures. The Table of Figures appears in the document which shows readers a list of all the figures included throughout the document as well as a brief description of the figure. This table also includes where each figure is located in the document.